REPORTS in major newspapers focus on the negative elements of today’s news, tempting one to assume it’s all gloom and doom on Earth. But could there be another side to the story? Turmoil is increasing, both in the Church and in the world, while at the same time there is an unstoppable momentum towards true faith, peace and holy living. A new breed of Christian is arising. Mike and Lesley Griffin, from Charters Towers in north Queensland, and Fr Brian Taylor from Caloundra, recently experienced this for themselves while attending two significant international gatherings as part of their work as regional leaders of Worldwide Marriage Encounter (WWME) – in two different countries. Mike and Lesley and Fr Taylor were in Texas in May, representing the Pacific region of WWME at the world council meeting. The gathering attracted couples and priests from all continents. While such meetings have the necessary elements of business to be discussed, for Mike and Lesley, it was the experience of other cultures, brought together through a common bond of faith and the true international nature of WWME’s world council that was the richest experience. “It was quite a simple thing, but to join with the other participants in praying the Lord’s Prayer was an amazing experience,” Mike said. The Griffins and Fr Taylor also experienced the hospitality of the Texans and the strong Mexican influence on life and culture. But it was the second leg of their journey in May that was to be life-changing. At the completion of the Texan gathering, Mike and Lesley and Fr Taylor travelled to Fiji and the island of Taveuni to facilitate a meeting of Pacific regional leaders of WWME. 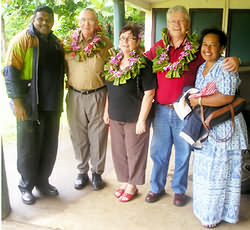 This annual gathering was held at the Tutu Marist Mission Centre on Taveuni, the third largest island in Fiji. “From the moment we stepped off the plane at the tiny Taveuni airport, we knew we were in for a special experience,” Lesley said. “We were welcomed by local Marriage Encounter leadership couple, Eric and Ma Narayan, who presented us with beautiful garlands made from locally grown orchids and other stunning flowers. We were very touched. The nine-day stay at Tutu for Mike and Lesley proved to be a revelation of how simple living people can support, nourish and live with each other in harmony. The Tutu centre, established in the 1970s, is a self-contained Catholic community that has a variety of programs that go further than anything in Australia. Young single women come to the centre from surrounding islands, stay for six months and learn life skills that range from cooking, sewing, budgeting and women’s health through to the spiritual aspects of their lives. There is a parallel program for young male farmers that teaches each intake of young men how to successfully grow their crops so they can support their own family when they marry. They are also taught how to look after their money and like the young women, also participate in spiritual formation. The Tutu centre has its own hydo-electric plant, a sawmill, a cabinetmaking workshop, a farm and numerous other initiatives that support this unique Christian community. There is also a Marist formation house for young men studying for the Catholic priesthood. During the Australians’ visit, there were 13 young men from all parts of the Pacific attending classes. Tutu sits on the international date line so a novel experience was standing on the date line with one foot in today and one foot in yesterday – an interesting thought. But for the visitors from Queensland, it was the warm, friendly nature of the people, who welcomed the visitors into their lives that touched Mike and Lesley and Fr Taylor and the other WWME leaders from around the Pacific region during their stay at Tutu. “It was amazing how the things we see as important back home in Charters Towers seemed so insignificant all of a sudden,” Mike said. “The centre has electricity, but only for part of the day, but that reality just wasn’t important and that surprised me because I do like my home comforts. “And while we did not have a single hour to spare during our nine-day stay at Tutu, the pace of life and the parallel priorities were just so different. “God has a most significant presence at Tutu. That was certainly our lived experience. “This is a place that is changing people’s lives daily. “We left Tutu when the time came and were very touched when a number of the locals shed tears as we said our goodbyes. Worldwide Marriage Encounter is an international movement that has as its mission the renewal of the sacraments of matrimony and the priesthood through a weekend experience and an ongoing group support program.